These beautiful japanese drawings demonstrate how you can further simplify images with a unique style. Now you can learn a different way of portraying landscapes and other subjects with just a few strokes. In my opinion, it's very magical! On this page, you can see my interpretation of images that appealed to me. Mine aren't exact and nor are they meant to be but I don't want to offend those talented Japanese artists of the past, so I will call my imitations Japanese-style drawings. I probably haven't transferred the symmetry properly because I'm sure there is a meaning behind every stroke they make. My experience is limited in that area of composition but I hope to achieve something similar to their rhythm and grace one day. It was by pure accident that I stumbled upon some old japanese drawing books and wow, it's made a world of difference to me. I was astounded at the beauty of their images that were comprised of so few lines, it is amazing. This effortless type of portrayal is the answer to all beginner artists' dreams! 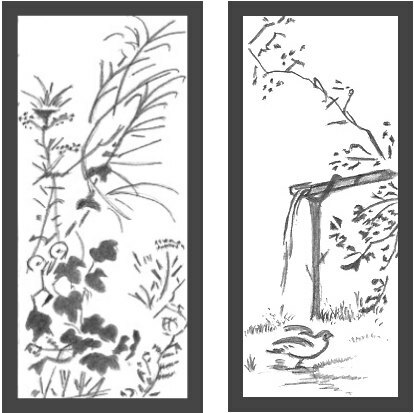 In the pretty image on the left and with the exception of the bird, do you notice how it's mainly comprised of single strokes and dots? It's an honor to share these works from Japanese artists with you because their influence may change the whole way you draw any subject. If you want incredible drawings with a minimum of lines, do yourself a huge favor and take some time to study Japanese art. Granted, a good majority of their work is done with a paintbrush but they use it with such dexterity, it may as well be pencil. It's so incredible really and I'm in awe. If you at least have a go at copying their images, you will certainly gain enormous enjoyment from it. They know how to truly portray subjects with a minimum amount of fuss yet the subject is easily identifiable. After copying from their examples, I'm just in love with Japanese drawings. They make me proud that I drew such a good representation without getting bogged down with detail and they don't take much time, either. I draw for my own pleasure with no desire to sell and I'm not claiming these creations as originals by me. It's through their generosity that they kindly share their beautiful line art in order for us to learn and grow. It makes you open to finding out more about yourself and your capabilities. I spend a lot of time studying a good variety of artwork, to find bits and pieces that I like so I can incorporate that one special effect (or several) in my work. This is how you ultimately distinguish yourself from the rest. All artists copy when they learn how to draw, no-one starts blindly without a teacher of sorts and nothing will convince me otherwise. The thing is, by studying Japanese art, you learn how to be different by putting your own spin on artwork, how to make your images stand out from the rest and to find the inspiration to push yourself to greater heights. If you love simple and easy drawings, this creative style is right up your alley. Did you ever think to draw a cat like the one here, with so few lines? It never occured to me and I spend all my time searching for ways to simply things! 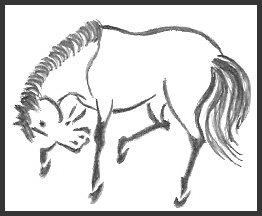 The way that Japanese Artists draw animals is fascinating. It made me realize that I'm my own worst enemy by thinking animals are more difficult to depict when all I have to do is look for the flow of main lines that make up their appearance. Many different Japanese drawings are showcased in a whole chapter in the Drawing Tips for Beginners Kindle book so if you're hooked like me, make sure you see it to advance to another realm in your artwork. If you don't have a Kindle, you can download a free Kindle reader for PC, Macs or other devices here. If you're lacking in self-confidence, there's an easy solution to that problem by getting rid of any compulsion to be perfect. It really restricts you and who needs that? I know I don't want to see perfect pencil images, that's what cameras are for. Be yourself and appreciate whatever drawings you create. There are plenty of people who are content with envying others who can draw without even trying to see if they can do it for themselves. As crazy as it seems, they become your audience and your fan club. All you have to do is practice until you master something so that it becomes an automatic, unconscious skill. We all make mistakes and none of us are perfect but you can be good at anything if you remember that practicing is the key! Separate yourself from the crowd and experiment with what you can do with a pencil. Seriously, it's not a lot of work! Once you discover that you can draw, from that point on, the world is your oyster. I hope that these Japanese drawings give you the impetus to experiment, to push that pencil as far as you can to prove you have all the skills you desire. Take charge of your ambitions by believing in yourself. 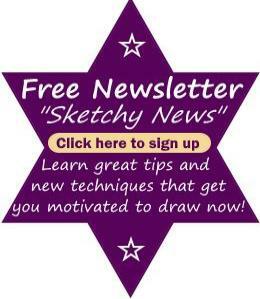 Drawing will change your life but first you have to instigate the change by making an attempt.